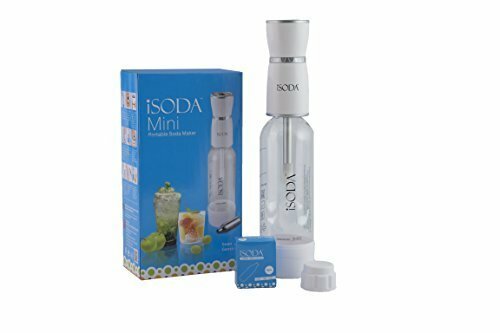 View More In Soda Makers - Page 3.
iSODA Mini is the world's most advanced compact soda maker. It combines innovative design with patented new technologies to deliver a product that is easy to use and produces fresh, sparkling water every time. Quick Connect bottles (compatible with all iSODA makers) attach quickly and securely, and stay connected until you take it off. A unique Turbo Bubbler tip increases CO2 solubility for smaller, longer lasting bubbles that taste better. The unique self-cleaning filtration system traps dirt and dust, producing thousands of clean, fresh drinks - safely and reliably. Uses one 8g CO2 charger to carbonate one liter of water. 8g chargers can be recycled with aluminum cans, and use less space. Available in five colors: Swan (white), Blue Jay (blue), Met-Red (red), Silver (silver with orange trim) and Pearl (silver with chrome trim).